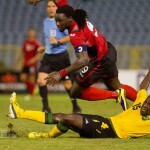 The “Soca Warriors” are back. The Trinidad and Tobago national senior team shot up 37 places to 49th in the latest FIFA rankings, which is the country’s highest rank in eight years. 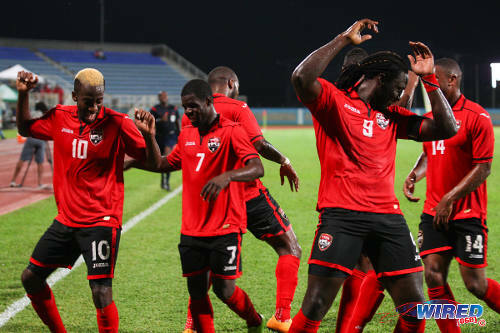 Photo: Trinidad and Tobago scorer Kevin Molino (far left) leads teammates Hughtun Hector (second from left) and captain Kenwyne Jones (second from right) in a goal dance during this month’s 2014 Caribbean Cup qualifying action against Antigua and Barbuda. 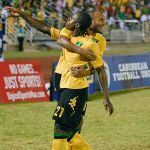 At present, the Warriors are the highest ranked Caribbean team and fourth in CONCACAF behind leaders Costa Rica, Mexico and the United States respectively. It is the first time that Trinidad and Tobago has been listed among the top 50 nations in the world since April 2006. Still, there is need for context. 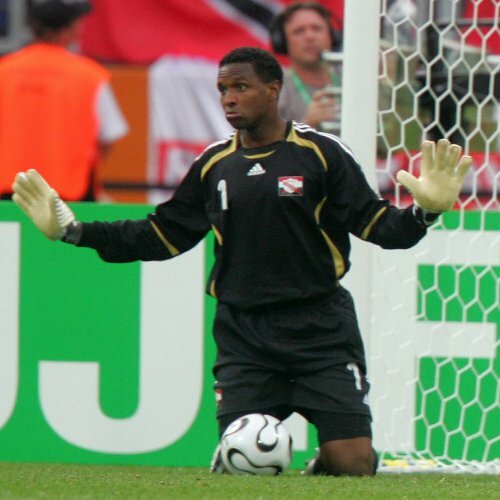 In July 2006, after the Warriors rubbed shoulders with Sweden, England and Paraguay at the Germany World Cup, Trinidad and Tobago actually fell 17 places to 64th position and was eighth in CONCACAF behind nations like Canada and Panama. This is because FIFA places inordinate weight on victories, even against less heralded nations like St Lucia. So, in terms of FIFA’s ranking system, Trinidad and Tobago is better off skipping major tournaments and tough friendlies; and feasting on beatable nations instead. And no one would suggest that the Warriors’ results last month against the Dominican Republic, St Lucia and Antigua and Barbuda were more awe inspiring than a draw with Sweden and narrow defeats to England and Paraguay at the 2006 World Cup. On the plus side, if Trinidad and Tobago stays within the top 70 FIFA nations for the foreseeable future; it means that Warriors will be eligible for work permits in Britain by July 2016. Footballers only qualify for British work permits if they are from nations ranked within FIFA’s top 70 countries over an average of two years from the date of their application. 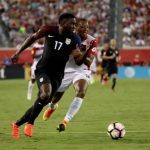 The applying player must have featured in 75 percent of his country’s competitive international games, once healthy, within that same time frame. Trinidad and Tobago has a history of remarkable success in British football for such a tiny nation. Dwight Yorke won two England Premier League (EPL) titles with Manchester United and a host of Cup competitions while Marvin Andrews and Russell Latapy won the Scotland Premier League (SPL) with Glasgow Rangers. Yorke, Shaka Hislop, Clint Marcelle, Stern John, Jason Scotland, Carlos Edwards and current Warriors captain Kenwyne Jones have played in the EPL while Latapy, Andrews, Scotland, Jerren Nixon, Brent Sancho, Collin Samuel, Kelvin Jack and Anthony Rougier starred in the SPL. At present, Scotland, who represents Hamilton Academical, is Trinidad and Tobago’s only top flight player in Britain. As usual everyone focusing on the negatives. Truth or lie one hopes this ranking will give some encouragement to our current team to try that much harder to earn their “49th” place. Also Canada has been doing disastrously since last year so i don’t see why we shouldn’t be ranked before Canada. Not sure about the other three but i do think the timing of this release is suspect. Looks like Tim Kee has as much power as we former chief or maybe, maybe he’s still there lurking in the background somewhere. A huge joke remember d Czech Republic 2006 ranking and their stella performance at the WC? the T&T clubs need to address that. too many opportunities have come and gone for them to take a stance and raise their voices. But they continue to drop the ball. Benefit who Raymond Tim Kee the TTFA? They ain’t help our footballers get their monies back from JW. It’s better for the players to be given a chance to showcase their talents which could help them get a contract at a big foreign club. The TTFA IMHO needs to be revamped. Thanks for putting into context. allows them to get better friendlies, for one. gets the players into some clubs in England and the EU which need players to come from programmes in the top 60 (i think, somebody correct me) and better TV payments, which will go to the TTFA. So what does this ranking do for the state of football in Trinidad and Toabago.. I wouldn’t be getting too excited just yet. It’s whether they can hold onto being in top 70 when the next transfer window comes around is the big thing. We have been here before a couple years ago where we were down to 60 something but by time the transfer window came up we were had dropped the rankings again. The boys have some big games coming up in Jamaica and that’s all they should be concentrating on not these rankings right now. Come January let us see where we sit then get excited! FIFA rankings are pretty much baseless and senseless, but say what. We still have a lot more work to do ! Our standard is no way near that of USA, MEXICO, COSTA RICA, HONDURAS, PANAMA, GUATEMALA! Ah lie? Yep we’ve beaten all those teams in several world cup qualifiers before. We even beat Mexico to make the 2006 World Cup playoffs which we qualified for. Yes we stumbled over the last few years but finding our bearings again. What a catch! Or did TTFA management knew what they were doing? Is FIFA. They have more catch than fishing on mosquito creek. Well, when you read the story, you will see there is a “blind spot” with the FIFA rankings as well. So there is a catch. Climbing back to prominence sans Jack Warner! I wont say the rankings have flaws then again name a system that doesn’t, after all our opinion or not the top leagues like the epl set their criteria based on these set rankings. 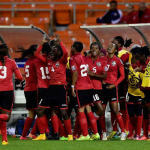 We trini’s are the most ungrateful people in the world, team struggles be bash dem, they do well and their’s progress we bash the system smh, I think its a reason to celebrate, not to take it for granted but to celebrate our progress, it is good for the players, good for the country and it means now that we will also attract better quality friendly internationals. If we were to use the same measuring stick that many of you are to bash the Fifa ranking system then all world champions in boxing should be discredited. But that catch kinda deadly, Lasana. So we can improve our standing by trouncing minnows ad nauseum and cherry-picking the tougher opposition? Then the ranking system has some serious flaws.